When I was little, we rarely ate spaghetti with meatballs, but we frequently had spaghetti with meat sauce, which I've come to think is vastly superior. Meatballs have always struck me as too fussy. I like having the meat more evenly distributed throughout the sauce. All the better to impart its flavor to mingle with the tomatoes, garlic and aromatic vegetables. More likely, this is the way my mom made it, so it's the way I make it too. This was one of the first dinners I learned to cook; I've been making it for about 20 years. A little wine is essential to this dish. I used to use red wine, although more recently after having made bolognese several times, I've switched to white, which imparts wine flavor without the added tannins of red wine. 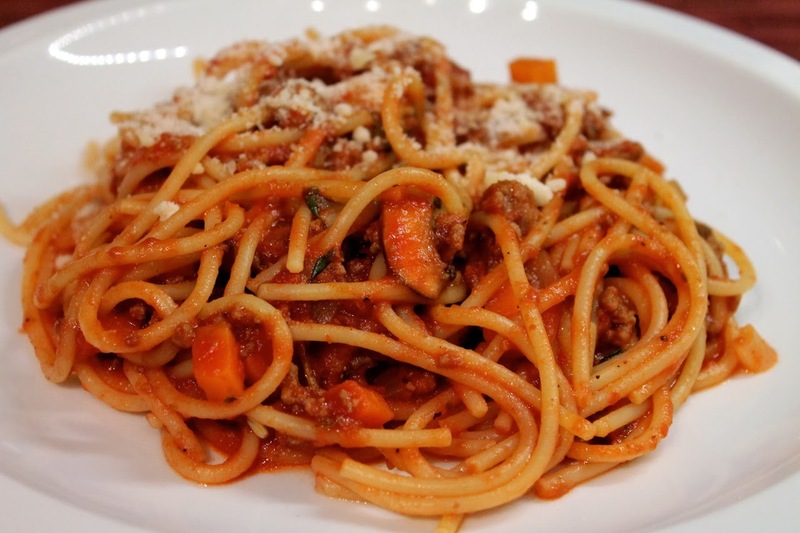 In fact, I've fashioned the ingredients of this version of the dish after a bolognese, but instead of cooking it all afternoon, it's done in under an hour--short enough to make this a dependable and delicious weekday dinner. A technique I've used recently for most pastas works well with this dish. 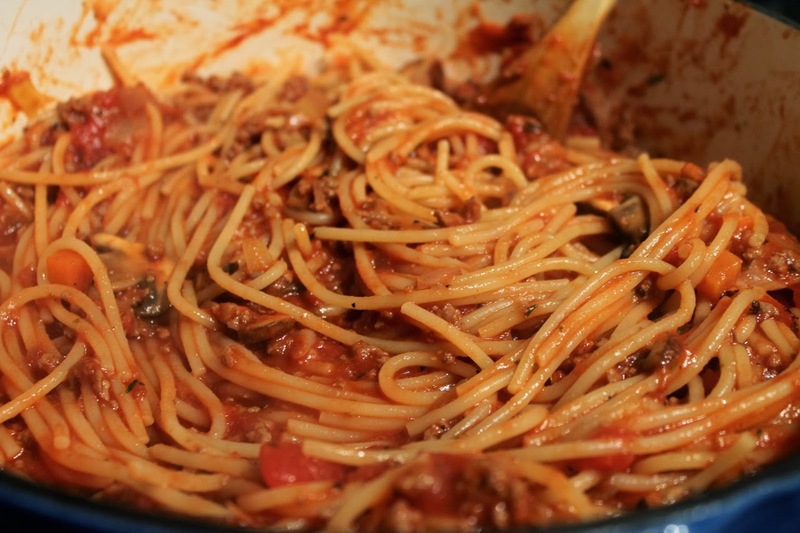 Instead of cooking the noodles as long as required for "al dente," stop the cooking short about 2 minutes. Drain the noodles and then add them to the sauce when the sauce is almost done cooking. Stir to combine and cook the noodles in the sauce for the remaining couple minutes. The noodles soak up the flavor of the sauce this way while they finish cooking, helping to integrate them into the dish. 1. Heat a large dutch oven over medium heat. 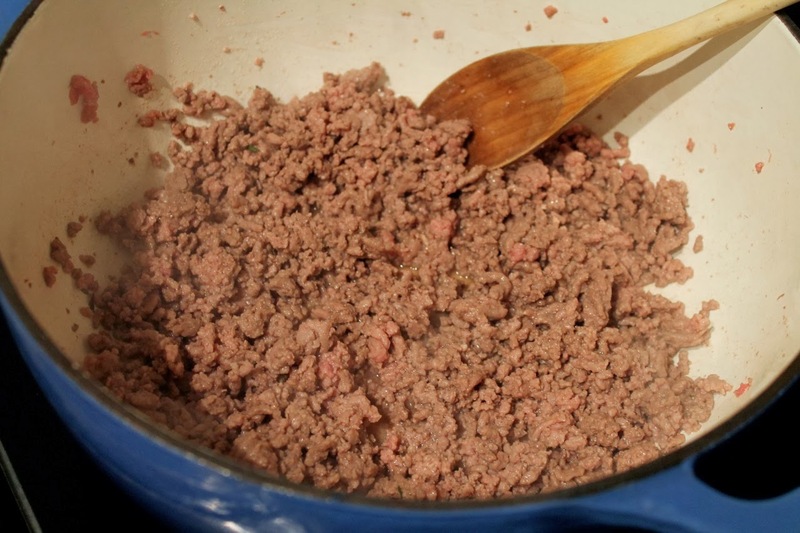 Add the ground beef and cook until browned, stirring to break up. Remove meat from pot with a slotted spoon. Drain off the fat (note: because pouring hot fat out of a hot, heavy cast-iron Dutch oven is fraught with potential disaster, my tip for removing fat after browning meat is to fold up a couple of paper towels, grasp them with kitchen tongs, and swipe the towel around the pot until the desired amount of rendered fat is soaked up in the towels). 2. Increase heat to medium-high and add 1 tbsp. olive oil. Add onion and carrot and season with salt. Cook until they start to soften, about 5 minutes. 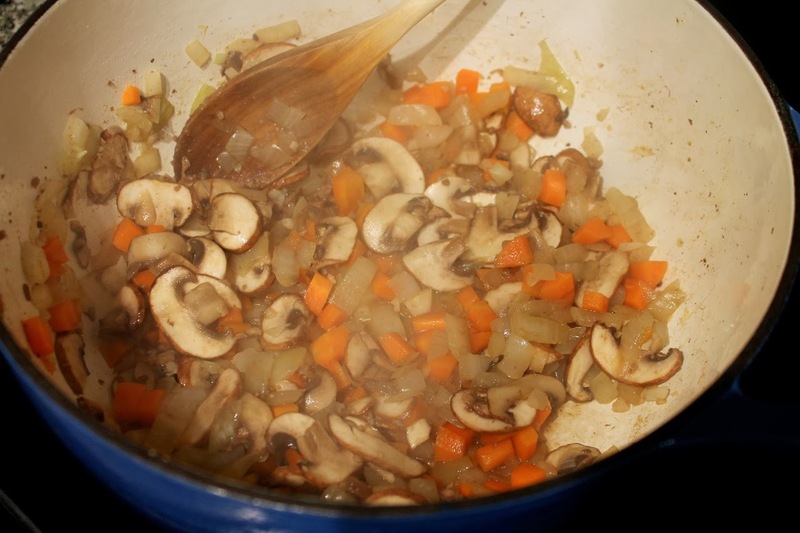 Add garlic and mushrooms and sauté until the mushrooms are lightly browned and the other vegetable are quite soft, another 8 to 10 minutes. Add back the cooked ground beef and add the wine. Cook, stirring occasionally, until the bottom of the pot is dry. Add the diced tomatoes and crushed tomatoes. 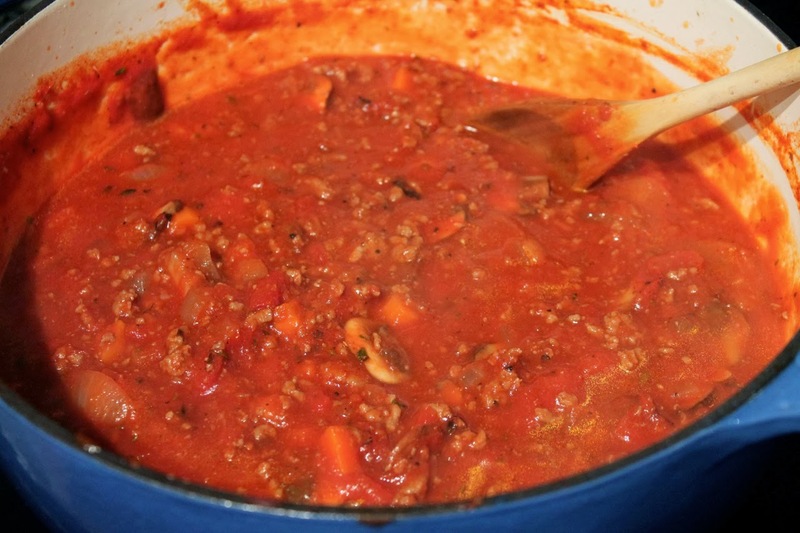 Use the 1 cup of water to rinse out the crushed tomato can and add the mixture to the pot. Add the thyme, oregano and pepper. When the mixture bubbles, reduce heat to medium-low and cook at a low simmer for at least 15 minutes, up to 30 minutes, stirring occasionally. 3. Bring a large pot of salted water to boil. 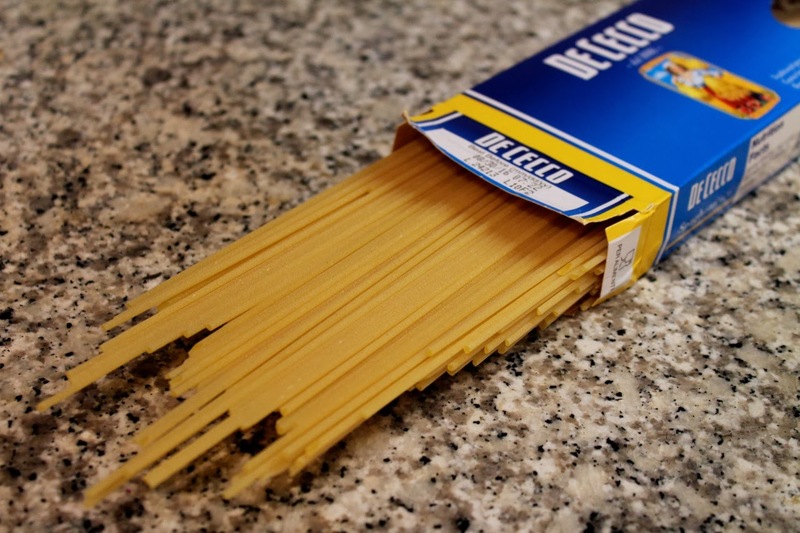 Add spaghetti and cook 2 minutes less than the package direction for al dente. Drain noodles and add to the pot with the sauce, stirring to combine. Continue cooking for 2 to 3 minutes until the noodles are cooked al dente. 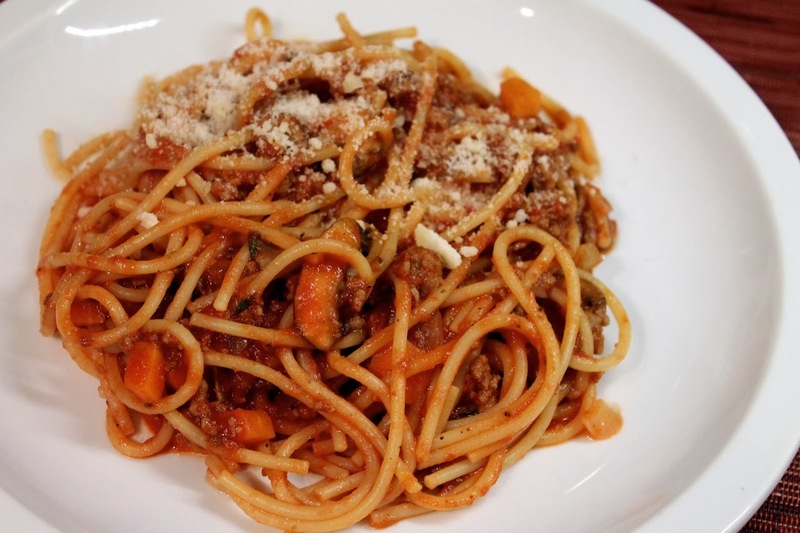 Serve spaghetti on plates topped with grated parmigiano-reggiano cheese. Your spaghetti is the best. I agree: Meat sauce is the way to go.